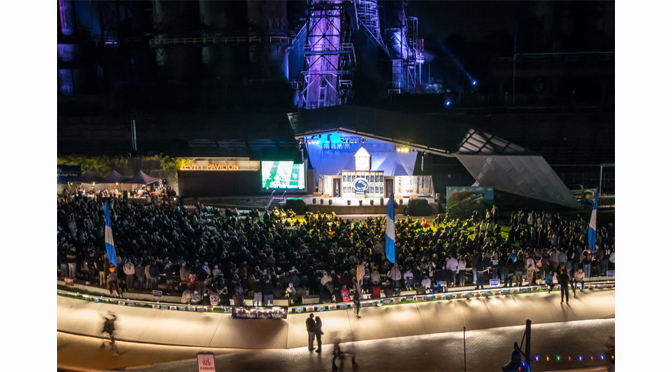 BETHLEHEM, PA—Join Penn State Lehigh Valley and ArtsQuest in cheering on the Nittany Lions football team at SteelStacks, as Penn State faces off against University of Illinois Sept. 21, 9 p.m. and University of Michigan Nov. 3, TBA. The free viewing parties include the big games shown live on the Levitt Pavilion’s large outdoor television screen plus food and drink specials like buffalo, sweet chili bacon or garlic parmesan wings for $1 each, as well as featured items like fried pierogis, nachos and the new Yuengling Golden Pilsner. On both days, the fun begins one hour before kickoff with a visit by the Nittany Lion, who’ll get the crowd pumped up and pose for photos. Celebrating the 2nd Annual WE ARE Lehigh Valley Homecoming Week, ArtsQuest President & CEO Kassie Hilgert, a Penn State University alum, and Lehigh Valley Chancellor Tina Q. Richardson will welcome the crowd on Sept. 21. Fans attending the viewing party Nov. 3 are encouraged to come dressed in white to show their support for Penn State for a special “White Out” party. Following the festivities, attendees can then catch all the action on the Levitt screen; limited seating is available, so attendees are encouraged to bring folding chairs and blankets if they plan to sit. Food and beverages will be available for purchase throughout both events at both the Levitt Pavilion’s Mack Truck Stop and the ArtsQuest Center’s MIKE & IKE Bistro; parking is available in the public parking lots on First Street, only a short walk from the Levitt Pavilion. For more information on these and all ArtsQuest Center events, visit www.steelstacks.org.